Oops it’s been quite a while since the last update. Dad has been lazy to update for me. But anyway he is doing it, so maybe tonight I shall sleep and not wake him up. We’ll see about that if his snores will disturb me. Anyway I was recently admitted to the KKH. It was a controlled admission, or rather voluntary on mum and dad’s part. 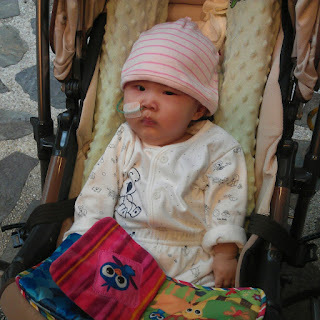 The reason was that we have been advised by the feeding therapist to get a nasal feeding tube put into me. I was kind of struggling through oral feeding of liquid, plus there is the danger of silent aspiration as a VFSS had shown previously. So the nasal feeding tube would bypass the throat and down into the stomach. This is to help me receive my adequate amount of milk or water each day, and reduce the chances of liquid going into my lungs. I was admitted in the afternoon. Without waiting long, I had the nasal tube inserted by the nurse. Definitely uncomfortable. Mum and dad were then guided on how to feed me through the tube. It was straightforward. Prepare Milk. Pour milk into big syringe connected to the tube. Pour until I am fed. But what isn’t easy was for me to not have any milk go through my mouth. Milk time just doesn’t seem the same anymore. I love my milk so much, yet I can’t drink it. I fussed and I fussed big time. But mum and dad soon realised that I like baby biscuits too. So for milk time, while they pour the milk through the tube, they hand me a piece of biscuit to munch. Well…in such times, one has to lower their expectations. The next few days, dad was the one learning to put the tube in with his slightly trembling hands. So everyday, I had a change of tube with the home care nurses guiding dad and mum through. Dad was the one to learn first and so he did most of the change, as he was told that he need to be able to put the tube in by himself before we are able to leave the hospital. With the tube in, it seem to affect my intake of solid food to a certain extent. I was choking more often. The air-condition in the hospital didn’t help too. It was cold and it made my nose run. And I saw myself in the mirror for the first time, I fussed too. I looked kind of different with the tube there I guess. But the more I saw myself, I got more used to it. I think I look badass below with the new beanie mum bought. 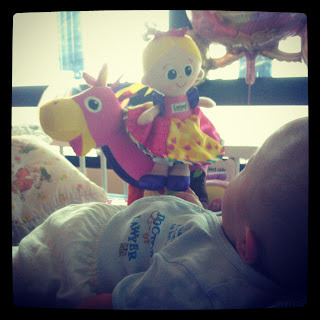 I also want to thank the people who visited me, brought me toys and played with me to cheer me up. Dad and grandma bought me a new toy each. Yi-yi and her colleagues visited brought me a soft toys and big balloons for me. Uncle Joe, dad and mum’s friend didn’t bring anything for me. But he brought dad and mum some muffins for their always empty tummy. The stay is over. I was in the hospital for about 6 days. It could have been shorter but I guess mum and dad are learning stuff along the way, but its just great to be able to leave the hospital. My solid feeding and my nose got better as I spent more time in the natural warm humid air of Singapore.